I’ve just seen too many times developers using Dependency Injection frameworks like Spring or Guice or Dagger the wrong way. Naming classes with Impl suffix is an Anti-pattern and i’m going to explain why. I think many developers simply don’t understand the point of dependency injection because they are just doing Impl services. I strongly agree with this: there is no point of creating an interface for a service which has only a single known implementation. Decoupling for the sake of decoupling has no sense. How does the PersonServiceImpl actually implement the interface contract? Does it look for a Person in a database? 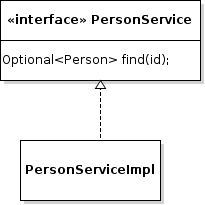 If another implementation of the interface is needed, is it going to be PersonServiceImpl2? You start to see what’s wrong here. In fact, naming an implementing class with the Impl suffix is a tautology. Every concrete class is of course an implementation of something. It’s like naming the service interface IPersonService, the I prefix brings nothing more than noise to the name. All modern Java IDE already point the different between implementations and interfaces in their UI. 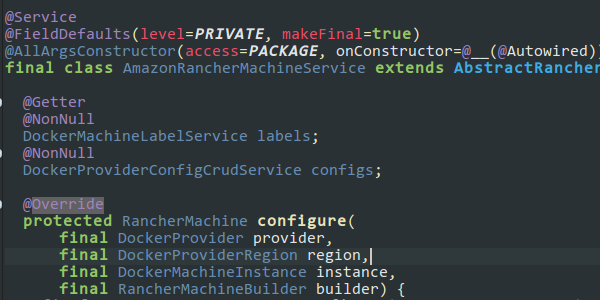 On the screenshot above, you can see that implementing classes inside the docker-machine-driver-amazon maven module are package protected. 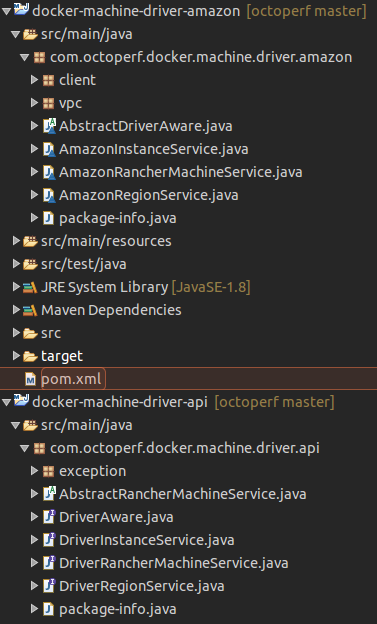 The implemented interfaces are located inside the docker-machine-driver-api maven module. We’ll see later why interfaces and implementing classes must be separated from each other. Good developers aim to be efficient. By putting unnecessary noise in class naming, the developer looses time by having to check what the implementation actually does. He needs to read the service implementation to know how it acts. This must be avoided at all cost to preserve the developers productivity. Naming a class with the Impl suffix is like telling I don’t know how to name it. If you can find a simple name for your implementing class, it’s a sign of code smell. Things that can’t be named properly are either too complex or doing too many things, thus usually breaking the Single Responsibility principle. Most of the time, the interface and the implementation are inside the same package, or at least inside the same maven module. Sure, you have just one ServiceImpl class, why would you separate the interface from the implementation? It’s useless if you tie the contract and the implementation together. The purpose of an implementation is to be replaceable when it comes to dependency injection. By injecting interfaces instead of implementations, you allow the implementation to be replaced by another as the code doesn’t depend on it. By shipping both the interface and the implementation tied together, you will never be able to replace the implementation with another without editing the code. That’s what most of the developers don’t understand, because they’ve just shipped interfaces with Impl all their life. Shipping interface and its implementation together is like shipping rims with unreplaceable tires. Who wants this? 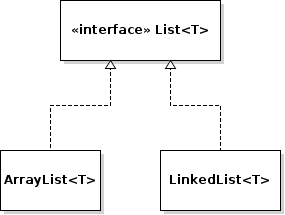 Have you ever seen a ListImpl inside the JDK? No, you don’t. Why would you name your classes with the Impl suffix then? This is where the API pattern comes to the rescue. We’ve seen that most developers just ship interfaces with their associated Impl together. The API pattern aims to separate the contract, namely the interface, and the implementation. This way, when you need to replace one implementation by another inside your application, you just need to swap the dependency pointing to the right implementation. No code change. 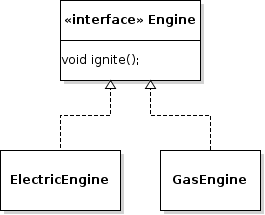 engine-gas: implementation of a gas engine which depends on engine-api. 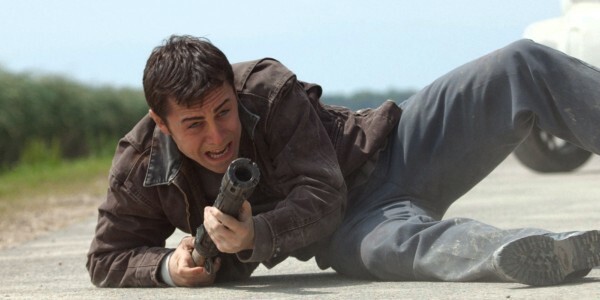 Any other maven module which depends on the engine only relies on the API. The beauty behind this pattern is that the car doesn’t care about which engine has been put under the roof. Each engine provide the same ignite method to start them. Implementing modules are only depending on API modules. If the electric engine needs to be replaced by a Gas engine, the dependency is simply replaced in the application dependency list. The application module is the only one to depend on concrete implementations. The API module provides the contract to implement, also known as interfaces in Java. It also provides the unit tests to verify that an implementation strictly follows the contract. It should never contain anything else. In this case, it’s the engine-api module. One implementation module must contain one type of implementation. This is why we have the engine-electric and engine-gas module. Those modules only contain implementing classes of a given contract. These modules should never contain any contract as they already ship implementations. I have created a full example application here: Design by contract. Suppose we want to model a Car which has an Engine. Nowadays, it’s possible to order a Car with a Petrol or an Electric engine. There is no EngineImpl. Would it be an electric or a Petrol engine? In this example, the implementations are quite obvious because the code relates to something physical. 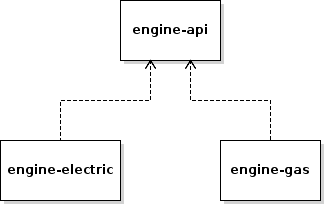 ElectricEngine and GasEngine have nothing in common, this is why each is in a separate maven module. Both engines can be unit tested independently. Even better, the classes depending on an Engine instance can be unit tested too without being forced to use any of the implementations above. There could even be a TestEngine inside a engine-test module whose purpose is to provide an engine for the tests. It often happens that your unit test may require some dependencies to be injected. It can quickly become a nightmare to get your service properly injected and started if all the dependencies are following the Impl pattern. The whole services tree will be initialized and there are big chances it will fail due to a missing resource like a database. This results in poor test isolation: the test is likely to fail when a dependency fails too. This is also known as cascading failure, and leads to hours of time wasted debugging. On the other side, if all your implementing modules are depending only on API modules, then you can inject mock dependencies instead of the real services. All the services which need to be injected can be replaced by test classes, ensuring proper test isolation. If the test fails, you can be sure it’s because your service fails and nothing else. No time is wasted debugging obscure dependencies. While the client team works on the client code, the API teams works on desired implementations. 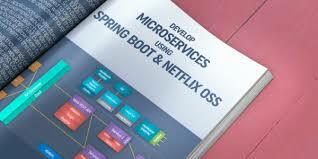 This provides a highly parallelizable pattern which greatly helps to scale a development team. It reduces the wait time between the teams as everyone can get to work even if each team hasn’t finished their part yet. The only bottleneck is the API contract definition. 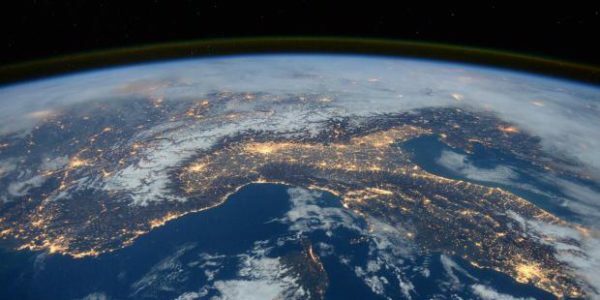 One could even imagine delegating part of the developments by outsourcing the implementation of the required contracts. External developers can be in charge of providing an implementation to the exposed contract. The goal of eliminating bad habits and practices in software development is to increase the development productivity and speed. Sure, we as good developers, like to work with pristine code. Why? Because it puts much less stress on our mind to work with well structured code. We can focus on shipping rather than messing around with bad code and wasting time debugging. Hi Jerome, Thanks for writing the informative blog post; made so many things clear. (BTW I’ve been doing this Impl thing). I have a query regarding section 1.4 Separation of Things because in your discussion you didn’t mention about the client of the interface who is in a separate package(module/repo). Now if you publish interface and implementation in a single package and later you update with another implementation in that case client also need to update the package. In that case, making an interface don’t serve the purpose? 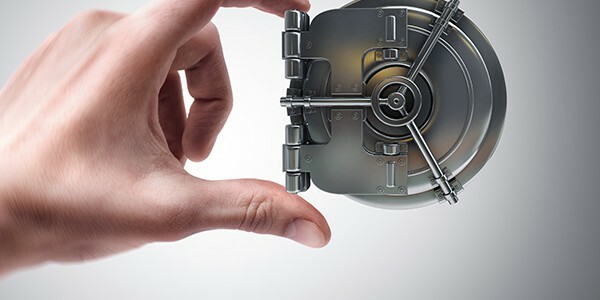 or do you say that keeping implementation name the same e.g., AddressAccessor (irrespective of the data strore - dynamodbAddressAccessor or mongoDBAddressAccessor)? If you keep interface and implementation in the same maven module, then the interface clients will have a transitive dependency on your implementation. This is wrong. The interface users should not be aware of the implementation being used. That’s precisely why people don’t see the point in interfaces and create Impl suffixed implementations. Only the final application module depends on the implementation modules to wire them together. It should not contain any code thought. Actually, no matter whether you have a different API mode or not, clients of your application will have a transitive dependency on your implementation. Maybe you meant non-transitive dependency? Anyway, people use “Impl” classes when there’s a single class implementing the Interface but you still want to expose the class in the ‘api module’ without linking your clients directly to your implementation. What do you suggest in this case? E.g., Imagine you have a ‘File’ interface in the API module; would you have a File implementation in a different package name in another module? I can’t agree with you that having an interface for a concrete class is useless and trashing the codebase. It makes the refactoring much easier, not only changing the underlying code but replacing a concrete implementation with another one later, or even adding new implementations. I think you haven’t read the article well because we’re basically saying the same thing. I’m not saying interfaces are useless. What i’m saying is: interfaces, like any tool, are used mostly the wrong way. Any code that depends on another module should only rely on interfaces, almost never implementations. That’s why I introduced the API Pattern: separate APIs and implementation in different modules. Module dependencies should be on API modules only, never on implementation of an API. That way, like you said, you can easily swap an implementation by another. 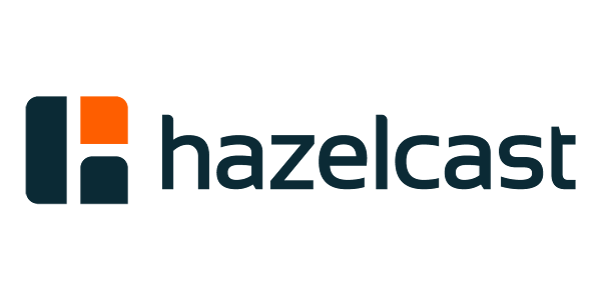 Either by changing the implementation within the classpath, or using Spring boot autoconfiguration based on properties value for example.